You are here: Home › Uncategorized › $1.00 Gift Wrapping for a Festive Touch! $1.00 Gift Wrapping for a Festive Touch! Until Monday, 24th December, 2018 we can gift-wrap your purchases prior to dispatch. 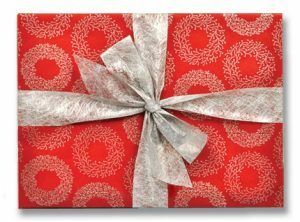 Just click the gift-wrapping option at the checkout and we will carefully and lovingly wrap your purchase with a thick Christmas-themed paper and finish it with a silver or gold ribbon (see image). The tax invoice for your purchase will be emailed to you – it won’t be sent to the recipient of the gift. Orders placed before 12.00pm on business days are dispatched on the same day of purchase. Delivery, national and international, is by Australia Post. This $1.00 gift-wrapping offer expires on Monday, 24th December, 2018.